Carroll Gibbons (January 4, 1903 – May 10, 1954) was an American-born pianist, bandleader and popular composer who made his career primarily in England during the British dance band era. In his late teens he travelled to London to study at the Royal Academy of Music. In 1924 he returned to London with the brassless Boston Orchestra for an engagement at the Savoy Hotel in the Strand. 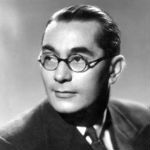 He liked Britain so much that he settled there and later became the co-leader of the Savoy Orpheans and the bandleader of the New MayFair Orchestra, which recorded for the Gramophone Company on the HMV label. In 1929, Gibbons appeared in the British film Splinters as “Carroll Gibbons and His Masters Voice Orchestra”. Gibbons made occasional return trips to the United States but settled permanently in England, though he did spend a couple of years (1930–1931) in Hollywood, where he worked as a staff composer for MGM films. He took exclusive leadership of the Savoy Hotel Orpheans, which recorded hundreds of popular songs (many of which were sung by Anne Lenner) between June 1932 and his death in 1954, all featuring Gibbons on piano.